Start 2018 off strong with Extreme Force, the first 100-card booster set of the year! 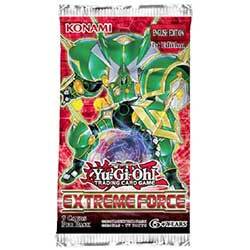 Extreme Force features a number of powerful cards that Duelists can add to any Deck, as well as brand new strategies and individual cards to bolster old favorites, like Noble Knights. Knights of living metal that enforce the law of the machine planet! They can be Special Summoned into any column that already has 2 or more cards in it. These monsters and the brand new �World Legacy� cards in Extreme Force combine to entrap your opponent by shrinking the number of zones they can successfully play their cards in. Add in standout Trap Cards Fuse Line and Broken Line from Circuit Break and you can gain absolute mastery over the field! Inspired by Mythical Beast Cerberus, a favorite of Duelists in real life and in Yu-Gi-Oh! Duel Links, brand new mythical beasts emerge from the mists of time! Just like the original Mythical Beast Cerberus, these monsters gain Spell Counters when Spells are played that you can use to fuel their incredible monster effects, but that�s not all! This time, each Mythical Beast is a Pendulum Monster with its own Pendulum effect, so your cards are monsters when you need to Summon and Spells when you don�t! Additionally, Extreme Force introduces the Deck of extradimensional terrors played by Akira Zaizen in Yu-Gi-Oh! VRAINS in addition to adding more Cyberse monsters to pair with the Structure Deck: Cyberse Link as well as Altergeists and Rokket monsters to go with the strategies that were introduced in Circuit Break. You can watch each episode of the latest Yu-Gi-Oh! series soon after it finishes airing in Japan on http://www.crunchyroll.com/ (Simulcast currently available in the US and Latin America).